"The IWW at least protects the colored man, which is more than I can say for the laws of this country"
At a time when Black Americans were under attack from Jim Crow laws, lynch mobs, boss racism, exclusion from the American Federation of Labour, and other forms of institutionalised racism, the Industrial Workers of the World union welcomed all working people into the union as equals. Incidental labourers such as Ben Fletcher, that fell outside of the AFL's preference for skilled white Anglo Saxon males, were able to join forces in the "One Big Union". Through the recognition of the bosses dependence on workers for profits, and the IWW's willingness to withdraw their labour and efficiency in political battle, the "Wobblies" demanded and won a better standard of living, and respect in the democratic spaces they created on the job. Fletcher was born in Philadelphia in April of 1890. Little is known about his life until his affiliation with the IWW in 1913. Thereupon he made a name for himself among blacks and whites working on the docks of the East Coast as a successful union organizer. By 1916 all but two of Philadelphia's docks were under IWW control. By 1917 dock workers had won their demand for 65 cents/hr against the bosses preference of 25 cents. And in non-IWW ships along the East Coast maritime employers could face a strike if the meals provided did not live up to the IWW standard. Improving race relations was recognised as a top priority by Fletcher and other union members. With a disunited workforce, organisers reasoned that working class solidarity would be impossible. Consequently employers could get away with more. 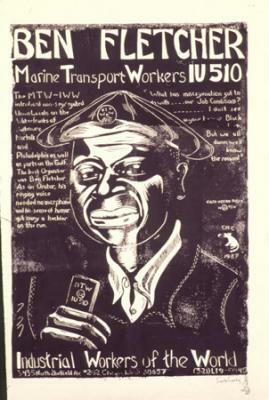 To prevent their bosses from taking advantage of divide and rule tactics, IWW dockworkers sponsored anti-racist forums to educate members. Additionally IWW picnics were held for workers and their families to socialise with the intention of building camaraderie. Unfortunately this was also a highpoint of working class solidarity on the docks. Industry’s drive to enter into World War I and their campaign to create a national mood for class collaboration, xenophobic scapegoating, and the repeal of civil rights was a success on their part. In early September the newly created FBI vandalised IWW offices across the country, stealing membership records on the false pretext that the union was on the side of the Axis nations and was plotting to render America weaker. Later that same month Fletcher was arrested for "conspiring to strike" - an act labelled by the boss press as treason. Fletcher was detained with hundreds of other Wobblies who all faced a myriad of charges ranging from speaking out against the war, dodging the draft, refusing to sign no strike contracts with their bosses, and engaging in "criminal syndicalism" - a law enacted by some states that aimed to outlaw the IWW as an organisation all together. Demonstrating his importance and singularity, Fletcher was the only African American among the hundred members of the IWW tried in 1918 for treasonous activities. While no direct evidence was provided against Fletcher, or his Local 8 union branch, or even the IWW (most of the “evidence” were statements of the IWW’s anti-capitalist beliefs, not any planned actions to interrupt the war effort), all of the defendants were found guilty—the jury came back in under an hour, all guilty on all counts. Fletcher was fined $30,000 and sentenced to ten years in the Leavenworth federal penitentiary in Kansas. While in jail, Fletcher’s release became a celebrated cause among African American radicals, championed by The Messenger, a monthly co-edited by A. Philip Randolph. Fletcher served around three years, before his sentence was commuted, along with most of the other jailed Wobblies, in 1922. After his release, Fletcher remained committed to the IWW, though never played as active a role as he had prior to his imprisonment. He stayed involved in Local 8 but generally remained in the background. He still gave occasional speeches, on tours and street corners into the 1930s. Fletcher’s health failed while still young, typical of longshoremen and other manual laborers. He also moved to Bedford-Stuyvesant in Brooklyn with his wife, where he worked as a building superintendent, until he died in 1949. He is buried in Brooklyn, New York. Despite this, Fletcher's legacy of direct action unionism on the docks hasn't vanished. In 1984 dock workers in San Francisco refused to unload cargo from South Africa, which Nelson Mandela later cited as re-igniting the anti-apartheid movement in his country. In 1998 Wobblies and others within the progressive International Longshore And Warehouse Union were taken to court by the Pacific Maritime Association. The PMA tried to sue dock workers that used a picket line to successfully prevent a ship with scab cargo out of the UK from being unloaded. The PMA's McCarthyite request that IWW and ILWU member Robert Irminger name names of those that participated in the protest, so that they could be sued for the resulting business losses, was ruled out by the court on basic first amendment grounds. Further pressure motivating the prosecution to back down in their witch hunt is the ILWU's success in shutting down the docks on the days of the court hearings. More recently, in 1999 the ILWU in West Coast US docks struck in solidarity with political prisoner Mumia Abu Jamal, a man on death row for a crime that millions doubt he committed. A book has recently appeared on Ben Fletcher and his times; Wobblies on the Waterfront by Peter Cole. Urbana/Chicago, Illinois: University of Illinois Press, 2007.